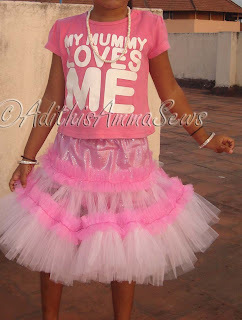 Adithis Amma Sews - Cute Confessions of a Sew Addict: Cotton Candy Skirt !!! This is my gift to my daughter for V-Day, albeit bit late, but it is better late than never isn't it. I started making this on VDay (Monday) and ended up finishing it only by Friday, my DD has still not fully recovered from an upset stomach and did not go to school since wednesday. I hope she gets well soon, it hurts to see her suffering, acidity at this age is just horrible, why because she started going to school full day for the past 10 days (before she started taking leave) and had to eat lunch on her own, which she doesn't like doing, and skipped, also feels stressed being at school for the whole day, the transition isn't over yet, anyone who knows pranic healing, please spend few valuable minutes of your time on my DD and wish her to get well soon, even if you aren't skilled healer, please do pray for her as all the good wishes will surely help her get back to normalcy. Here i am typing this early in morning, i guess 5:30 AM now, will go back and hit snooze button, i squeezed in time to post before she gets up. Will be back to normal sewing days once she is fit and fine! Very Cute! 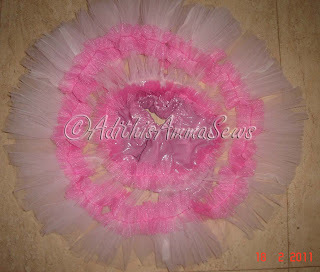 At least you finished...I still have a nearly finished pettiskirt by my machine...you are motivating me to finish it! You make it look really easy to do!! 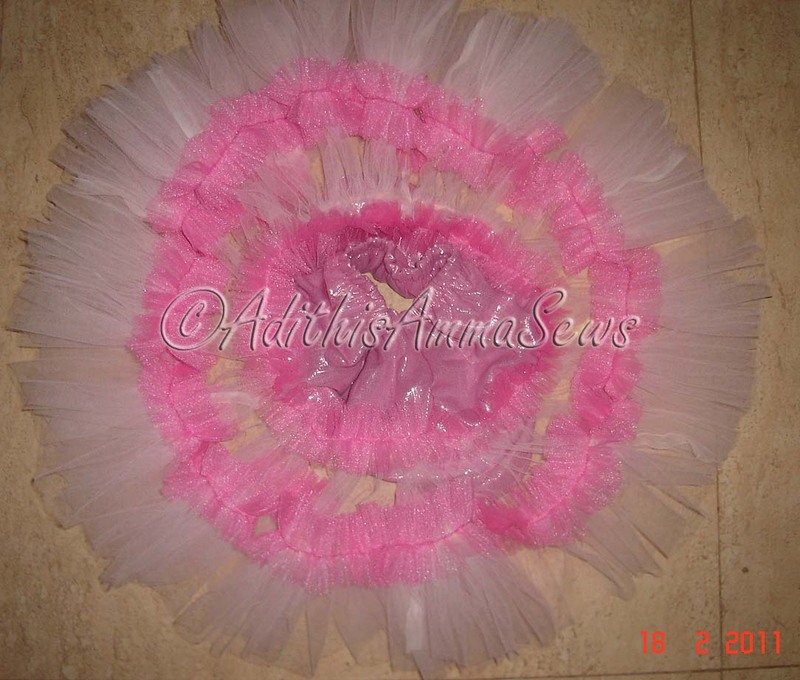 but it looks super cute! Thanks Magdamagda, Angel & Patricia. 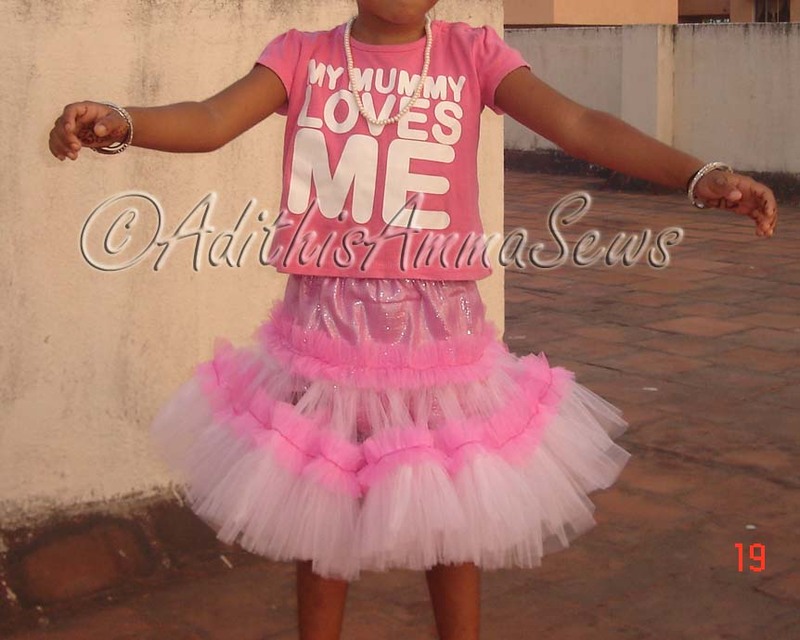 Guess what my DD does not seem to like this skirt much! sometimes certain things tend to grow on her a bit later, i hope it is the case with the skirt too! Lovely!!! I like it very much! Totally love it. So puffy, and bright, and her shirt is PERFECT!!! How darling she looks. You did great. 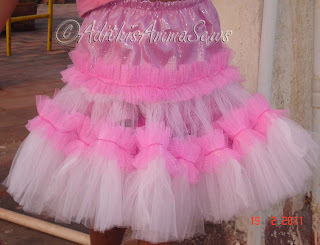 I need to make my princess some cotton candy skirts, he he. So cute.... you're so clever. Thanks Thendra, Miranda, Bella & Nikki. I love this! So cute & thanks for linking to my Fashion Friday Runway party! Oh my! How darling! I LOVE it! Thanks for stopping by and your sweet comment! will try to do a tute after diwali!